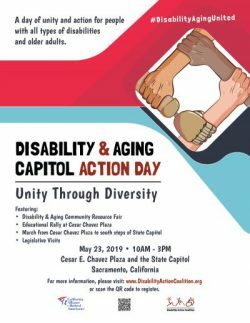 Disability Action Coalition is proud to partner with the California Alliance for Retired Americans (CARA) to bring you: Disability and Aging Capitol Action Day on May 23, 2019. Disability and Aging Capitol Action Day is a day-long event mobilizing California’s aging and disability communities at the State Capitol. The day is filled with opportunities to build community, learn about and share resources, educate our policy makers and elevate the collective power of older adults and people with disabilities. Free lunch provided for those who register. The participant registration process includes options to request accommodations. Please submit your reasonable accommodation request by May 10, 2019. DCAD attendees making their way towards the Capitol. 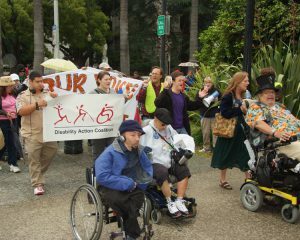 More than 1,000 people with disabilities of all ages, older adults, family, friends, and allies from across California.